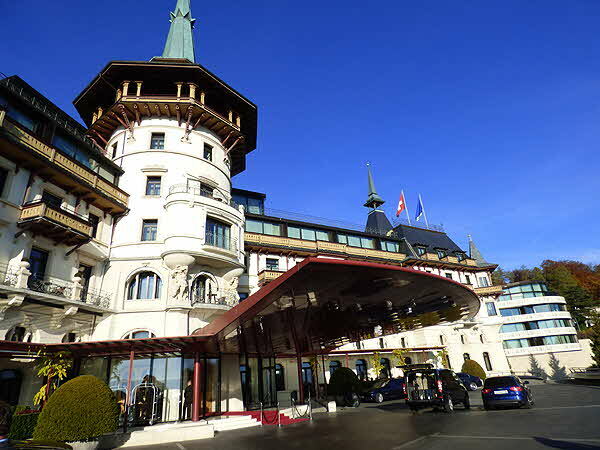 It’s called The Dolder Grand and it’s an incomparable example of what made the Swiss “Grand Dame”� hotels coveted by royalty and celebrities alike in the 19th and 20th centuries. Now upgraded for the 21st century, with the addition of two modern wings - the Spa Wing and the Golf Wing - behind the original 1899 historic building, The Dolder Grand still maintains the elegance of a bygone day. On arrival you are greeted like a cherished guest and introduced to the property with the enthusiasm shown by every staff member from the General Manager to the Doorman and everyone in between. The hotel is located at the edge of the Adlisberg forest, on the side of the mountain overlooking the city of Z�rich and its eponymous lake. It is considered a prominent landmark and was pointed out by our city guide as a must-see highlight when visiting Z�rich. One of the main reasons is the extraordinary collection of over 100 paintings and sculptures from some of the most famous artists of the 20th century, many of which actually stayed at the hotel. These works are on display in the gardens, the terraces, the courtyards and throughout the reception and the public spaces and are an open-air museum par excellence. The art work is so extensive that a computer listing of all the work is available at the Reception for guests to take a guided tour throughout the property. This is a modern art lovers paradise, a 5-star hotel accommodation and museum all in one. 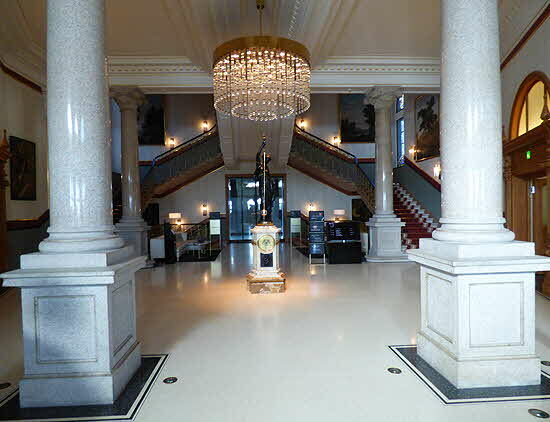 The Dolder Grand is considered a city resort, with 175 rooms and suites and is as prominent today as it was at the end of the 19th century when it first opened. I consider it as the epitome of the famous Swiss hospitality industry and our recent stay there, following our UNIWORLD Rhine & Mosel cruise, confirms my belief that when it comes to hotel management and guest accommodation, the Swiss are still at the top of the game. Our visit also dispelled the stories I hear about the stodginess of Swiss gastronomy, especially when it comes to the restaurants of some of the 5-star properties. 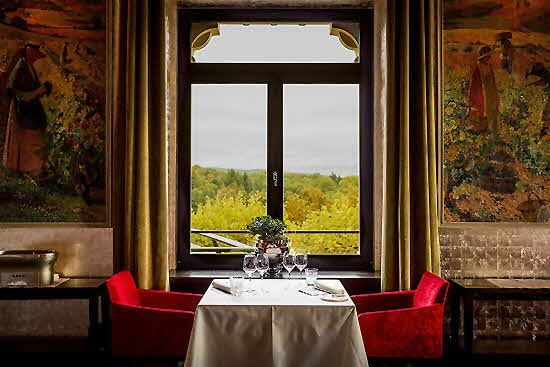 I guess, the Red Guide that gave the hotel’s restaurant and Chef Fine Dinning�� Heiko Nieder two Michelin stars, is well aware of the innovative dishes and exceptional service of the dinning room, which is simply called “The Restaurant�”. But more about our dinning experience later. We stayed in one of the junior suits in the modern Spa Wing. It was a large room with floor to ceiling windows and a terrace - perfect for dining el fresco in pleasant weather - with views that overlooked the driveway, golf course, the city and the lake far below. 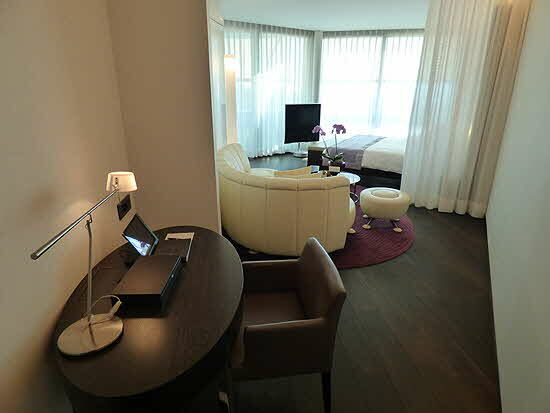 There was a desk as you entered the room, then a semicircular settee with a round glass table and a large flat-screen TV across from the king-size bed. Falenopsis orchids decorated the room and were refreshed daily. The bathroom was amazing, with a walk-through to the red marble double wash-stand on one side with the toilet and the shower glass-enclosures on the other side. A glass partition led to the water-jet bathtub accessorized with a tray holding bubble bath, candle and a small book of humorous illustrations along with fragrant soaps and gels. Opposite the tub was a glass door opening to the terrace with its glorious views and an automated wall control to open or close the curtains and shades as desired. Along the wall was a make-up shelf holding a large sized reversible mirror with daylight lighting attached, perfect for putting on make-up and securing jewelry. We were escorted to our suite via a glass-walled corridor decorated with art work and luxury items available at the gift shop. 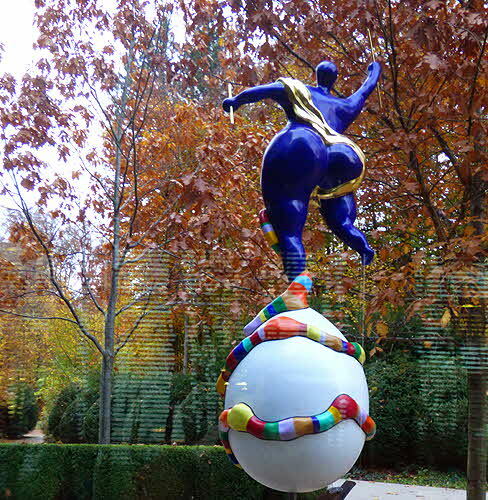 The back garden had one of our favorite revolving sculptures, Jean Tinquely’s and Niki de Saint-Phalle’s “Le Monde” seen through the glass walls; the corridor let to an all glass elevator which whisked us from the ground floor to our suite on the third floor. 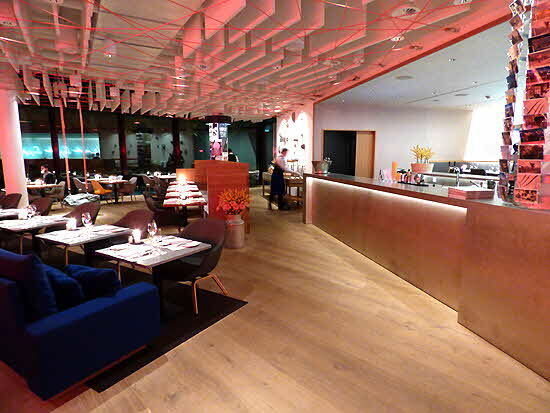 The hotel has two restaurants: Saltz, a 14 point GaultMillau restaurant is charmingly decorated in a modern fashion. It is a bright airy space open all day. 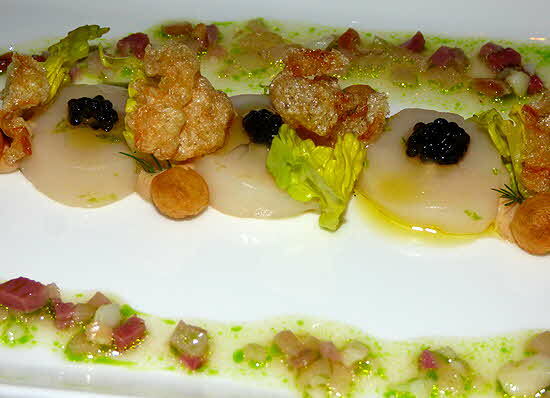 The menu is modern European featuring a number of seasonal dishes. The highlight is breakfast and, on Sunday, brunch with an abundant buffet. In the summer there is an open-air barbecue on the terrace but we were there during the cold months and the barbecue was not in operation. Heiko Nieder is the Chef Fine Dinning, in charge of the Michelin-starred “The Restaurant” since the property’s reopening in 2008. The Restaurant is open for both lunch and dinner during most of the week, with the exception of Sundays and Mondays. The Restaurant is closed for winter break, from February 19th to March 6th. The lunch offerings include a 5 course amuse-bouche menu (it is similar to tapas, highlighting successful small dishes created by the kitchen). Plus a 4 or 5 course menu featuring numerous seasonal recipes with or without wine pairings, and an a-la-carte menu. For dinner, one can select from a 5 or 8 course menu, a vegetarian menu, an a-la-carte menu or a 12 course tasting menu with or without paired wines. And talking about wines: The Restaurant has a selection list of 500 wines that includes rare bottles and some verticals that would delight wine aficionados. And yes, La T�che and other Roman�e-Conti exceptional wines were there amongst the other noteworthy offerings. Altogether about 1,200 bottles are stored under ideal conditions in the controlled environment of a wine cube, seen as one enters. There seemed to be Asian influences in many of the dishes the kitchen creates. Especially tasty were the Radish with blossoms and herbs, the summer role, the Peking duck chips, and the “baked potato”.. 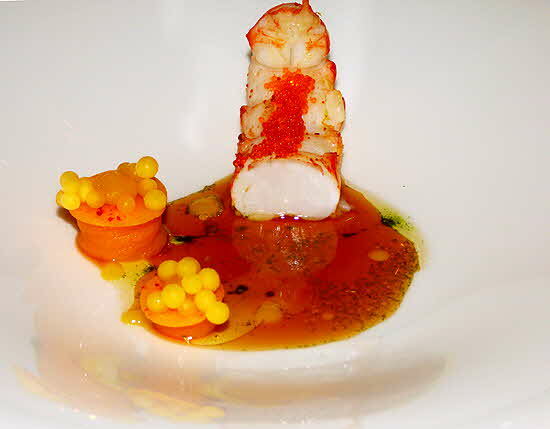 Spectacular was the Crayfish tail with Tobiko (flying fish) eggs, and the rice role with egg, sea weed and Togarashi. And the patisserie was not shabby either. 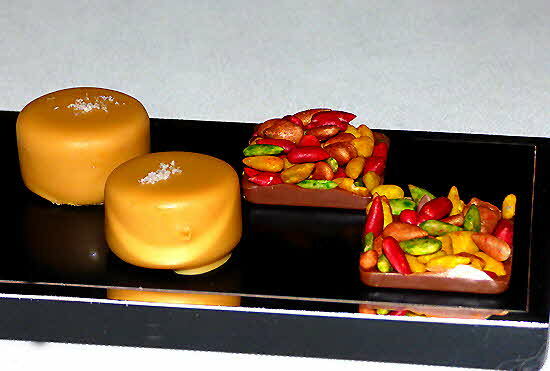 Loved the Peanut-caramel bonbon with sea salt and the “fruit stones” were as desirable as the written description was cryptic. Some of the dishes we were offered did not seem to be part of the regular tasting menu and I have no formal description of the dishes. It doesn’t matter... they were as scrumptious as the rest of what was prepared for us. One more item I should mention. The hotel has a shuttle bus that takes you down the mountain to Z�rich’s Old Town, every hour on the hour, or you can take the Dolderbahn funicular just outside the rear of the building which brings one to the bottom R�merhof station, where one can change to a tram or taxi to go into town. 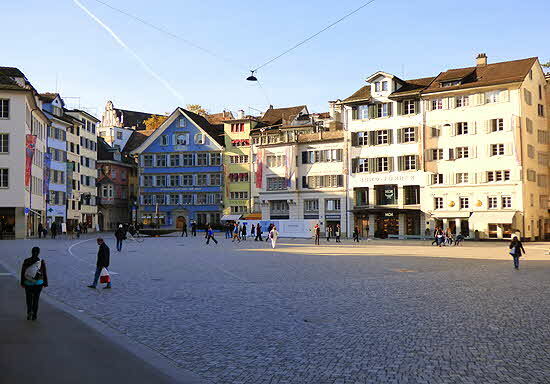 The shuttle ride goes to B�rkliplatz square across the river Limmat over the Queibr�cke, from where you can take a taxi or other means of transportation to visit the rest of the city. Or you can explore many of Z�rich’s notable churches, guild-houses, museums and other buildings of the Old Town including the Zeughauskeller, a restaurant in a historic armory that serves “typical Swiss-German food” such as grilled sausages, of which they have quite a large selection, served with potato salad and a side dish of sauerkraut, and decent beer. There you can experience indigestible Swiss-German gastronomy at its best! Thanks to Swiss Air International for their gracious support.